Some patients are not thrilled about their first time results from plastic surgery intervention. Honestly, it is a natural feeling that occurs every now and then among patients. This is why it is very critical to have a detailed consultation with a plastic surgeon for rhinoplasty Beverly Hills patients. There are plenty of other reasons why primary rhinoplasty does not achieve the ideal results of a patient, which is why we provide revision rhinoplasty. 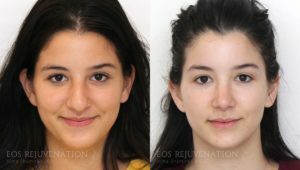 Revision rhinoplasty, is simply another nose job Beverly Hills patients elect for whenever a new problem arises, an existing issue goes untouched or to change the unsatisfactory appearance of the nose. A nose job is a complex procedure and first-time plastic surgery patients generally go into the procedure uneducated about the process. A revision rhinoplasty is performed similarly to the first procedure, the patient will be sedated with anesthesia and the surgeon will make the incisions depending on the existing scar tissue. Thus, the end result should reshape and adjust breathing quality to the patient’s preference. A nose that appears to have suffered from too much intervention may make the nose look over-done or over-operated on, which may make revisions more complex to handle but reshaping the nose is possible. In terms of Polly beak deformity, this details a nose that reaches a high point at the bridge above the nasal tip and curves downward, similar to that of a parrot’s beak. This occurs when a plastic surgeon removes too much bone and cartilage from a dorsal hump without reducing the top of the septum. It is also an indicator of excess scar tissue formation in the tip area. The rise of patient satisfaction is duly noted when it comes to finding the best facial plastic surgeon Beverly Hills patients trust. Revision rhinoplasty patients are more self-aware of their looks through self image sharing via social media, which is responsible for the significant boost in facial plastic surgery. As per a study from the American Academy of Facial Plastic and Reconstructive Surgery (AAFPRS), 13 percent of AAFPRS members surveyed identified patients’ dissatisfaction with their own image in social platforms such as Instagram, Facebook and Snapchat. The majority of patients to be the most likely of candidates for facial plastic surgery were 81 percent women in 2013, two-thirds of which were mothers. Nevertheless, men are not kept out of the equation. As they also hope to maintain a youthful appearance and an attractive nose. Take for example, my recent patient displayed here. He was unhappy with the final results of his previous rhinoplasty procedure, which also caused breathing issues. His previous nasal tip remained bulbous and developed Polly beak deformity, a hanging columella and arched nostrils. After revision rhinoplasty and cartilage grafting, his profile sits straighter, the nostrils are no longer arched and the columella is now lifted. If you desire to find out how to repair and reshape the nasal structure after your primary rhinoplasty then schedule a consultation for revision rhinoplasty. We will help evaluate your existing nasal appearance and other cosmetic issues, please contact our Beverly Hills cosmetic surgery clinic at (310) 772-2866.